Minister vows to continue his outdoor services for the homeless. 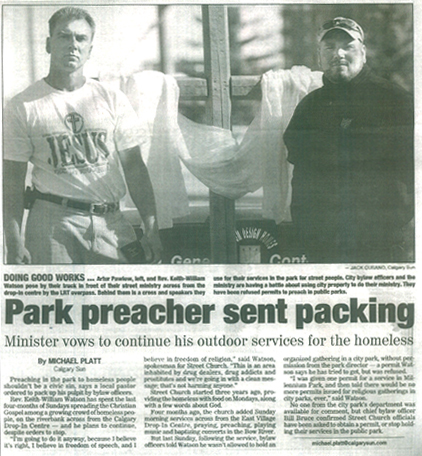 Preaching in the park to homeless people shouldn’t be a civic sin, says a local pastor ordered to pack up his pulpit by bylaw officers. Rev. Keith-William Watson has spent the last four-months of Sundays spreading the Christian Gospel among a growing crowd of homeless people, on the riverbank across from the Calgary Drop-In Centre – and he plans to continue, despite orders to stop. "I’m going to do it anyway, because I believe it’s right, I believe in freedom of speech, and I believe in freedom of religion," said Watson, spokesman for Street Church. "This is an area inhabited by drug dealers, drug addicts and prostitutes and we’re going in with a clean message; that’s not harming anyone." Street Church started three years ago, providing the homeless with food on Mondays, along with a few words about God. Four months ago, the church added Sunday morning services across from the East Village Drop-In Centre, praying, preaching, playing music and baptizing converts in the Bow River. But last Sunday, following the service, bylaw officers told Watson he wasn’t allowed to hold an organized gathering in a city park, without permission from the park director – a permit Watson says he has tried to get, but was refused. "I was given one permit for a service in Millenium Park, and then told there would be no more permits issued for religious gatherings in city parks, ever." said Watson. No one from the city park’s department was available for comment, but chief bylaw officer Bill Bruce confirmed Street Church officials have been asked to obtain a permit, or stop holding their services in the public park.